In Motion Outtake: 1967 Pontiac Firebird (400?). 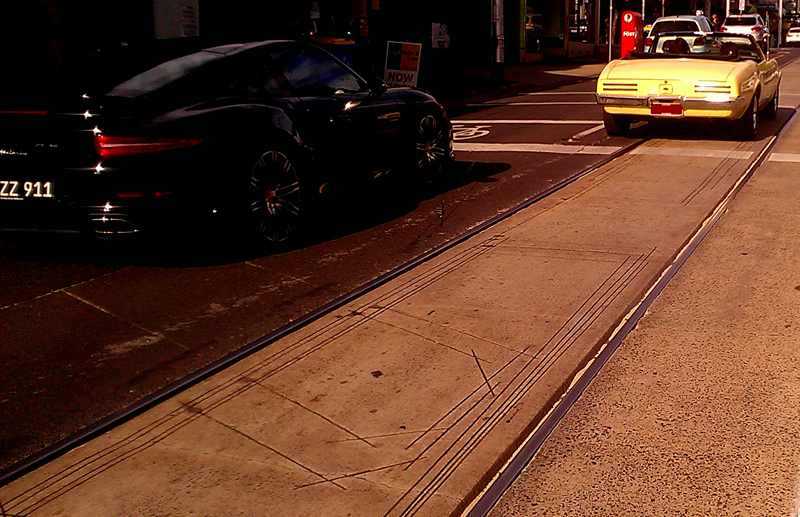 Yes, the sunglare is messing with the tolerances of my lowly phonecamera, but how often do you see one of these on the road? 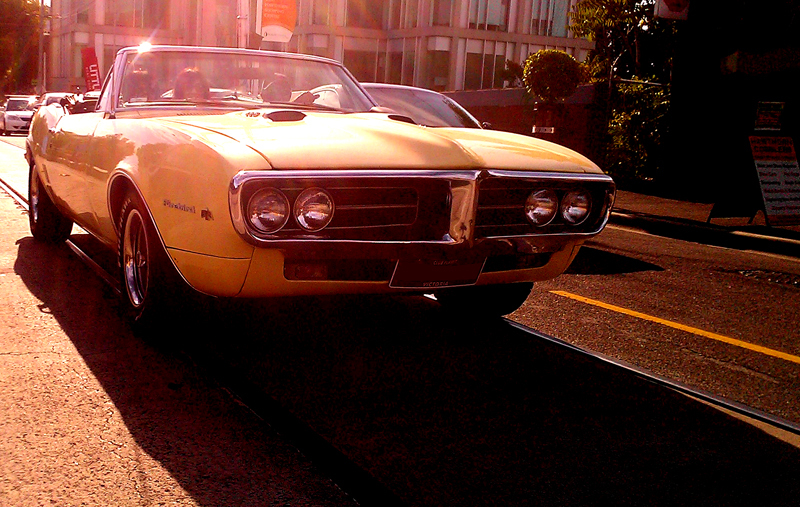 This Firebird’s occupants looked thrilled to be enjoying the weather in this sweet lhd ride, big smiles all round but not visible in this shot. Question for the CCognoscenti; do those scoops on the hood mean this is a Ram Air model? Answer: This may not be a 400. Thanks to Jamie and Red. Another P-car dozing in the shadows. Definitely nothing wrong with that first shot that a little playing with Picasa 3 wouldn’t cure. Wonderful composition. What a great summer car…not much of a yellow fan, but that looks fantastic! The hood scoops are standard on all Firebird 400 models, but are only operational with Ram-Air. Scoops on the hood did not necessarily mean the car was Ram Air equipped. I’m not very knowledgeable on GM cars (preferring Ford’s Mustang and the Mercury Cougar for 1967), so I’m sure someone will correct me, but Firebirds had hood scoops if they had the larger V8. There were only 2 displacements for V8s in 67, a 326 and a 400. My dream Firebird is located 50 miles away from me. It’s a 67 Sprint convertible in triple black. For the first year you had the base model (OHC 6), V8 (326 – probably the most popular model), Sprint (OHC 6 hopped up), Formula (not sure which engine, possibly both blocks were available) and 400. The TransAm didn’t come along until 1969. The five levels of ’67 Firebird are made clear in the Firebird brochure at Old Car Brochures: base, Sprint, 326, HO, and 400. None had optional engines; the base and Sprint both used the OHC-6, and the 326 and HO both used the 326 V8 (the latter of each pair had a higher compression ratio and required premium fuel). CC is recreating the neighborhood of my youth today. Neighbors across the street had a blue 66 Impala, and one of these Firebirds lived next door. Loved the slit taillights on these and on the 66 GTO. 67 Firebirds were not Ram Air. I’m not exactly certain, but that didn’t start catching on with the muscle cars until 69 or 70. According to Pontiac brochures, you could get Ram Air on both GTOs and Firebirds in 1967 and 1968. The Formula model designation did not arrive until the 2nd generation Firebird, in 1970. There were Fomula 350s and Formula 400s, but I think the 1st year it was only the 400 and the 350 was added as a “price leader”. And I could be wrong but I seem to remember the Formula 400s had optional Ram Air (which gave them more horsepower) while the 350s did not have that feature. Who makes your phone camera…….. Nikon? Because, that sun glared pic is wonderful. It may be Ram-Air equipped, but it would be a very rarely optioned one, if it were. Awesome car! Love to own that ‘bird! Gorgeous photos–that first one works perfectly. Love the glare, the shadows, even the color cast (makes it look vintage-y). This car does not appear to be a 400 model. I not see the Pontiac insignia at the point of the front chrome bumper. True 400’s had the insignia, and a slightly different grill. The Ram Air option was available in 1967. Definitely agree with the consensus, the photo is great – minor crop of the lower right, embiggen, and presto, new desktop background! from the vent windows on the doors, the turn signals tucked into the front valance and the lack of side markers we know this is a 67. jamie is correct it lacks the grey/black pontiac symbol on the front nose of the bumper and the proper inserts in the negative spaces created by the front bumper that would have come with a factory 400. in essence someone put a 400 hood on a different trim level – a common touch as 400s got junked or trashed, or crashed or just plain gave out. the parting shot shows the trunk lid without the 400 symbol on the lower right hand corner too. dont get me wrong – i am not nit-picking the hood upgrade. i miss my 68 right about now.